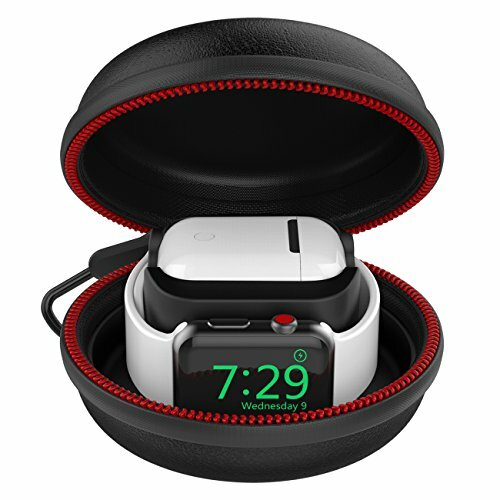 If you have this two Apple products, Apple Watch, Airpods, then you would like this new design case. The Charging Dock is made by classic black soft silicone, durable, sturdy and can hold your apple watch and airpods securely and stably. The Carrying Case is made by hard EVA material with Zipper, which can protect your watch and Airpods from scratch and impact, provide them from a full degree. Watch, Airpods, Airpods Charging Case, Original Magnetic Charging Cable are NOT Included. 【Protable 2 in 1 Apple Watch Dock】fits for all sizes and models of apple watch (38mm/42mm) series 3 / series 2 / series 1 /nike+ and apple wireless airpods charging case, charging at the same time and save space. 【Shock Resistant & Waterproof】 lightweight portable EVA travel carrying bag with a carabiner for you to anywhere. Recommended for business trip, traveling, sport, outdoor and home storage. 【What You Get】1 x non-slip dock;1 x durable EVA travel case;1 x metal keychain. 18 months warranty guaranty within 24 hours quick-reply and lifetime friendly customer service. If you have any questions about this product by HALIS, contact us by completing and submitting the form below. If you are looking for a specif part number, please include it with your message.